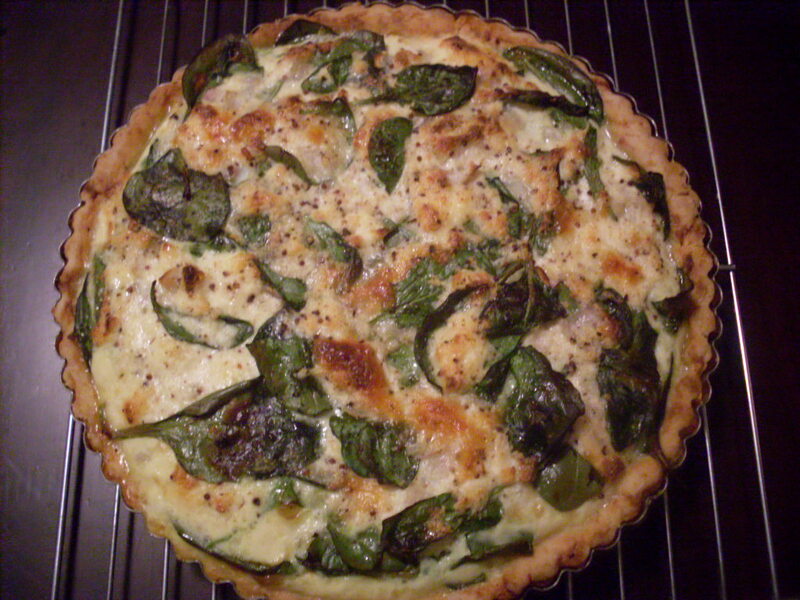 Quiche is nothing to sneer at and is plenty manly, thanksverymuch. I made quiche for Nick. In a different time, I’ve heard, it wasn’t so manly to eat quiche, never mind to want it. I met Nick in poetry class. The generations, how they gap. He wrote very long poems about damp shorelines and dead horses, and he wore scarves and I was convinced there was something wrong with him because he wasn’t madly in love with me. I thought he was the kind of guy who’d like quiche, you know? It’s just as well: I was never interested in the kind of boy who’d frown at quiche. And as it happens, that kind of boy was never interested in me either. And here we are, a couple of years later and that’s all, and I mentioned quiche the other day and he kept reminding me I’d mentioned it. Nick wanted quiche. 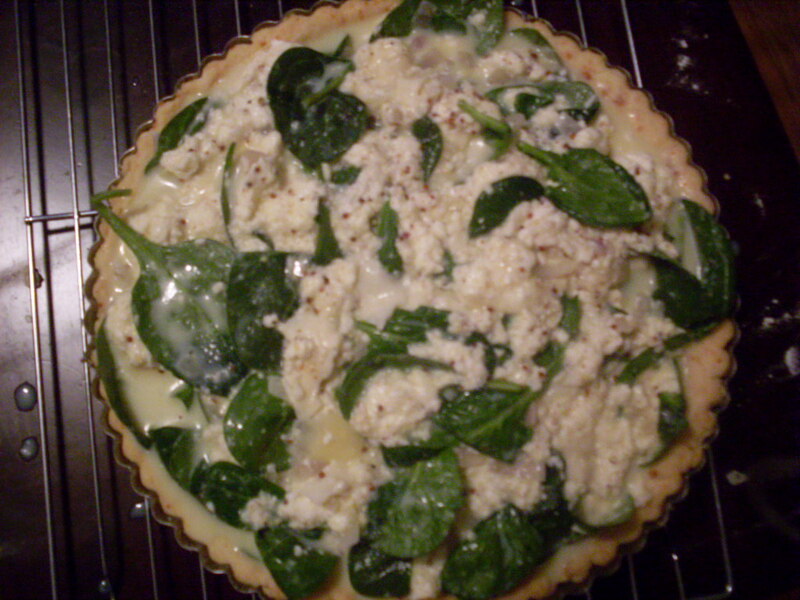 So I set out to buy some seasonal greens and a bit of whole milk for ricotta, and I made Nick an eggy pie for dinner. I wanted to tell you about the quiche that had the chard in it, but my market was out and I was too lazy and too high up in heels to try another store, so I guess I’ll tell you about the spinach quiche, though I’d like for you to imagine it with chard. It’d be easy enough to substitute the chard for the spinach, just blanch the chard first. You don’t have to do the same with the spinach, because it’s wimpier. 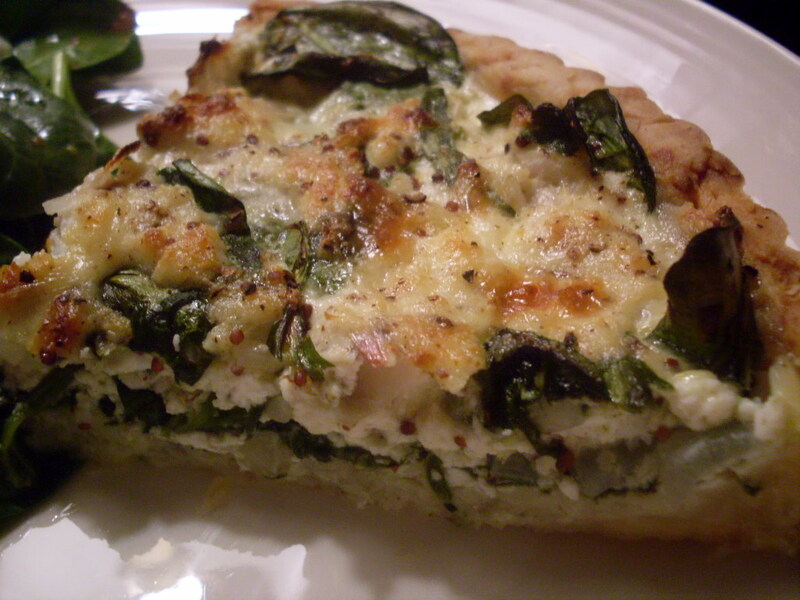 Nick would have liked the quiche with chard better, I think, because chard is a manlier green, probably. (It’s perfectly lovely with spinach too, I’m just being unpleasant.) I suppose we’ll try again next week, maybe Monday when the shelves have been restocked. Assemble pastry in the typical way, crushing the butter between your fingers into the flour, salt, and Parmesan. Stir in beaten egg and ice water until dough forms. Wrap in plastic, and refrigerate for 30 minutes. Roll the dough out with a bit of flour, and press into a nine-inch tart pan. Roll the rolling pin across the top to trim away the extra dough. 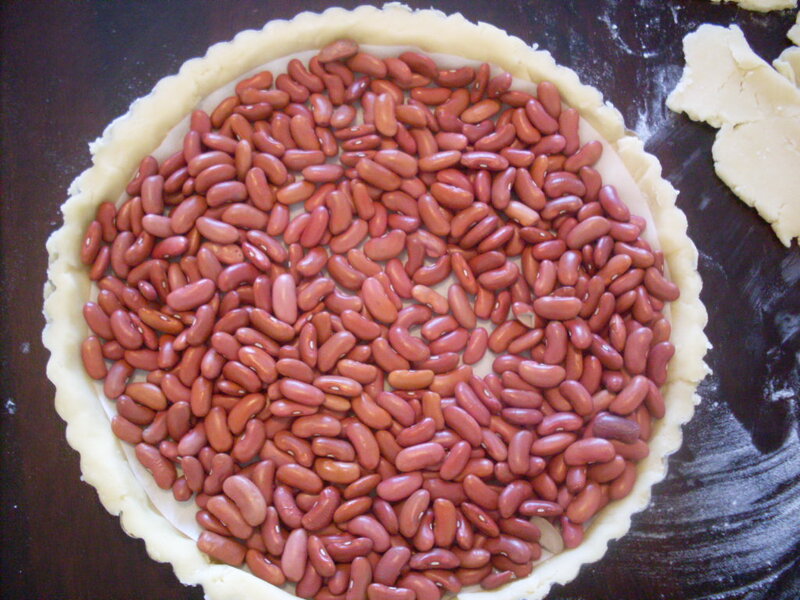 Line the pie crust with parchment and fill with dried beans or pie weights. Bake at 400°F for 20 minutes. Remove pastry from the oven. Cool slightly, remove beans and parchment, and continue to cool. Until cool. Meanwhile, leave the oven on. Sauté shallots in butter. Remove from heat and set aside. In a large bowl, whisk together your ricotta, milk, eggs and egg white, mustard, salt, pepper, Parmesan, and nutmeg. Add your shallots and butter to the mix, and whisk again. Taste now, and adjust your seasonings as needed. 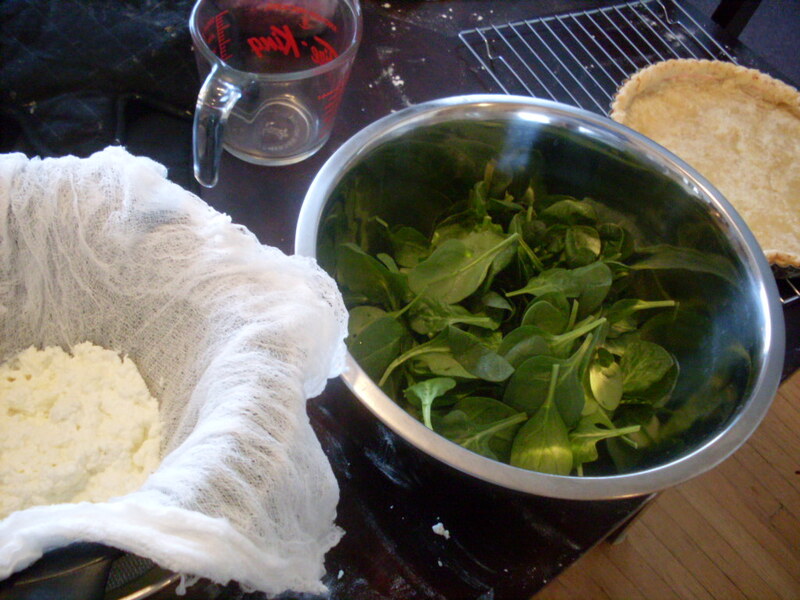 Stir in your spinach or chard, and pour into the pie crust. Bake mixture in shell for 4o to 45 minutes, until golden and slightly puffed. Cool in the pan on a wire rack for 20 to 30 minutes before serving. Remove from tart pan to slice and serve. Enjoy. It smells so good, and is the creamiest quiche in the history of ever, because of the fresh ricotta and because when you’re making something like quiche, you just sort of will it to work, and those happy thoughts make it into the oven with the pie. Serves four for brunch or dinner, or more if you’re cutting it smaller to make it an hors d’oeuvre. Nothing dainty about it. Isn’t it nice that anyone can have this sort of thing now? Yes. Yes it is. And besides, I wouldn’t serve something like this to anyone who’d sneer at any sort of homemade pie. We don’t take kindly to those types around here, poets or not. Next > Homemade soy milk? Not difficult, and cheaper than anything ever. I love this blog for many reasons, but I am always bowled over by the seemingly simple tips I pick up. I was all “why the hell would you bake beans into the bottom of a quiche?” then it was all “DING! To keep that huge bubble of crust from forming on the bottom like it ALWAYS DOES for me”. I will be doing this. More pastry is in my future. I’m glad I could help! Don’t forget to poke the holes in the crust with a fork. These things must breathe, yaknow? Cooking lovely things with witty instructions while listening to Ms. Bruggergosman is my idea of a perfect Sunday morning. Thank you Emily!